How can you Get Rare Birds? 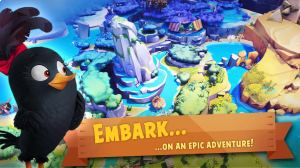 This free-to-play turn based role-playing video 3D puzzle RPG game is another addition to the Angry Birds franchise and like previous installments involves slinging birds into an arena so they bounce off enemies to do damage. There are over a hundred new Angry Birds characters to collect and evolve so there is plenty of new content to explore. The game itself is divided into chapters where every chapter pits you in multiple arenas and opponents with different skills. What makes this game different from previous version is the pigs get equal opportunity to take a swing at your birds. How Do You Put Together a Good Team? How Many Kinds of Eggs are There? How can you Get More Eggs Fast? Is it Worth Farming Eggs? How can you Get More Gold Coins? How can you Get Free Gems? How can you Increase Your Inventory? Is it Worth Joining a Clan? No discussions open for Angry Birds Evolution at the moment.